Local regulations prevent me from using foam products - what are my alternatives? Some areas have introduced legislation to ban the use of polystyrene foam food service products, such as cups, plates, and take-out containers. Fortunately, we offer a variety of alternatives for every business and every budget. Check out our full selection of paper and plastic dinnerware, and we even have eco-friendly options too! 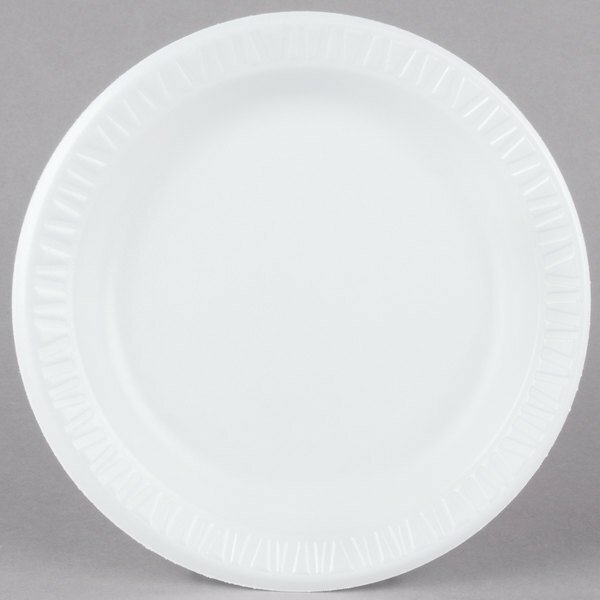 Easily serve entrees and side dishes with this Dart 9PWCR Concorde 9" white non-laminated round foam plate. 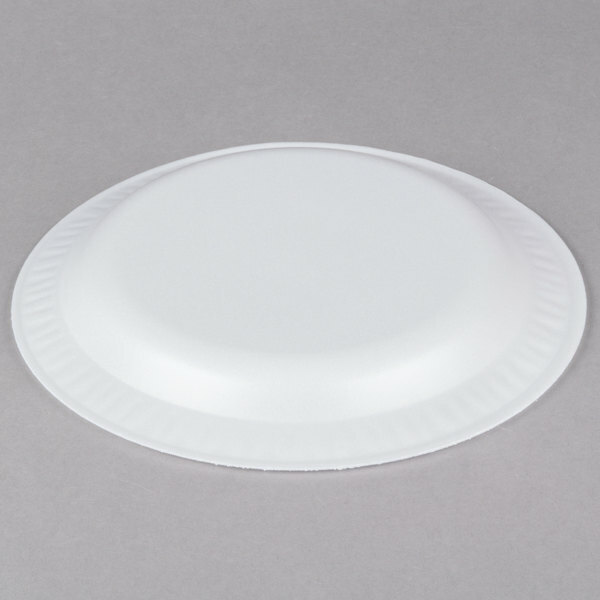 Offering the same Dart quality as comparable laminated versions, this foam plate is lighter than standard plastic plates and is perfect for your picnic, party, buffet, or other catered event. To reduce messes and spills, it boasts deep shoulders and a wide rim. Plus, it has a non-absorbent foam construction that also prevents liquids from leaking through. This plate's inverted structure, textured ledge, and lightweight design provide easy product separation, enabling you to quickly distribute each plate and keep your buffet lines moving! It is also insulated to reduce heat transfer, and keep cold dishes cold throughout an entire meal. Once all the food is gone, enjoy a quick and effortless clean-up with its disposability. Made without chlorofluorocarbons (CFCs), this plate is great for serving guests and is better for the environment! These plates are pretty sturdy and doesnt break easy at all. 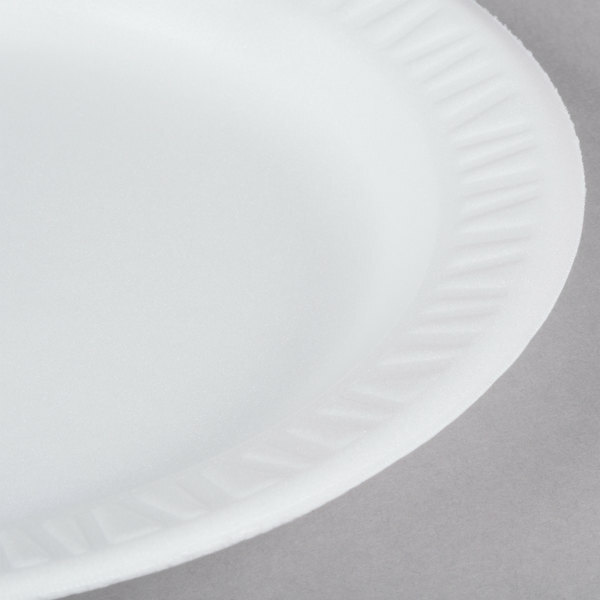 They are much better than the average paper plate and very cost effective ! Economical plate for most take out applications. Non laminated means they won't hold up as well to sauces or foods that require cutting with a knife, but fine for pizza and picnics. Plates are very sturdy and good quality. The packaging also makes them easy to store or stack. Plates dont get ripped apart if someone is using a knife. Can't beat the price on these! The quality of these plates are great and much cheaper than all my vendors. Will be definitely ordering more! These are so amazing and perfect for on my counter for customers to take !! they are super sturdy just the right size and you cannot beat the price I will never order anything different amazing and highly recommended!!!!! These are great plates for on the go or just use at home. They’re very sturdy when it comes to holding a heavy food. I experienced no issues on performance so there I’m recommending this product. This product is amazing. The one problem i have with this product is when i order pizza. The plate keeps breaking. So far good job. We have been using these plates in a childcare center for a few years. They are decently sturdy, but heavier items will crack the plate if you are not holding it from the bottom, does great with HOT foods though. These plates work really good for holding all kinds of food. We use them for serving food at many lunch or dinner events and they are very sturdy. And they are a really good price. Good product and cheap price! Good for breakfast items and desserts. I Will definitely order again. Shipping is little bit high but still you can able to save some money. Non glazed plates are good for the people who want to avoid ingredients from animals. Plates are sturdy strong and work good for rice and meats. I ordered these foam plates to use for appetizers and desserts. Good price and good quality- the plates did it's job. The 9" is a perfect size for regular use. We did not use all of it during my sister's reception so I keep it in my cupboard for daily use when I don't want to do the dishes. These plates are excellent to use on customers eating out in or out of the store. They are sturdy and sold at a good price! Pretty sturdy plates. Great for a Barbecue or a picnic. I like using them when more of the family comes over. A large number of quality plates for a low price! These work well in our business. On our food stalls these plates come very handy. A little on the lighter side but good buy for the price. These dishes have proved to be very strong for our generous lunches. Our cook is very happy that they hold up and so are all our patrons. They are pretty sturdy for the most part and do quite well with holding the food and moisture. It's a fair price for a quality material plate. A very good deal for 500 plates. They are sturdy for a any type of food. I use them for any type of large events that want quick food with out the hassle of washing dishes. These plates are very sturdy and can hold a lot of weight and moisture. Perfect size for any bakery needs. They come packaged well with no breaks. THE PLATES COME IN HANDY FOR EVERY OCCASSION, AND I AM SURE MY FAMILY AND FRIENDS WILL GET PLENTY OF USES OUT OF THEM. AT ALL OF MY PARTIES AND DIFFERENT GATHERINGS I USE THEM INSTEAD OF CHINA PLATES. Oh my God, for the price of these plates, you can never go wrong. The quality and quantity i get for the price was amazing. Just perfect for the occasion. Great product-delivery was fast! Price very reasonable. Website was easy to use. I will definitely use this site again. Keep up the good work!